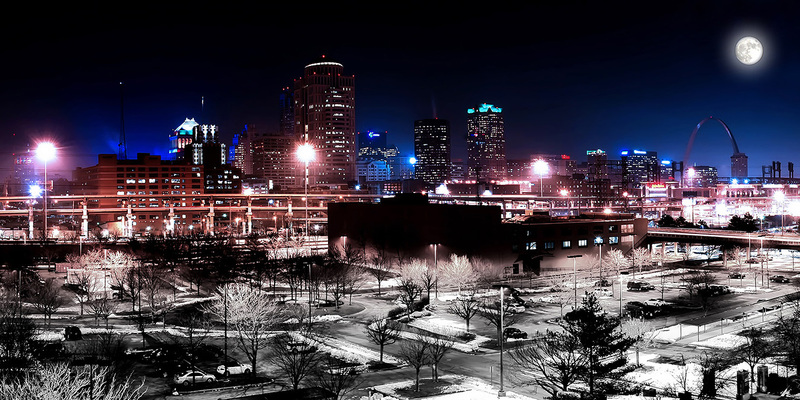 Being a big fan of St.Louis’ lighted architecture, on Dec. 16th, 2013 I captured a 6-image panoramic photograph of downtown St.Louis during rush hour, under the light of a full moon. Portions of this photograph have been on my Facebook page, but this is the full, complete photograph. Versions of this photograph are also available for purchase in my Shop. “Moon Over St.Louis” was on display in the Sheldon Art Gallery in St.Louis, Missouri from August 2014 through September 2014. I am also happy to say that “Moon Over St.Louis” was chosen to be featured in a book of St.Louis photographs titled “The City @ 250” from the art show published by the Sheldon Art Gallery. Here is a video describing more about the book.